it's my fault that jar jar took the stage this week. but surprisingly mostly everyone showed up to the party! either for a secret love of the character or an eternal burning hatred. i float somewhere in between. as much as he's annoying, he's nowhere near as annoying as the kid who grows up to be darth vader. so sad. a few years back, whilst doing way to many shows i made a decision. when at shows we do sketches. you name a character i'll draw him, her, it. i love the challenge... the thing i hate is when someone comes up and states "draw whatever you'd like." y'see the thing is i hate to think at these shows and after doing sketches all day your kinda burnt out. 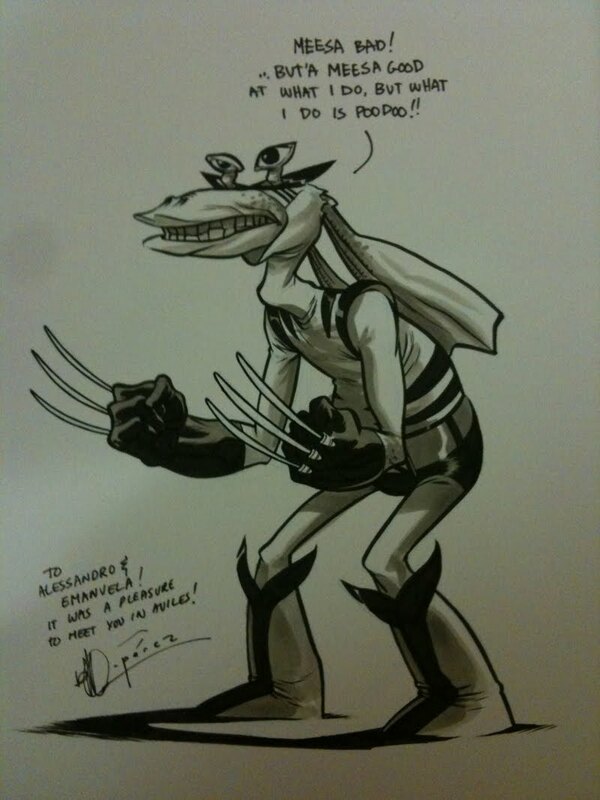 so these days if you ask for whatever... you get jar jar binks. "so these days if you ask for whatever... you get jar jar binks."